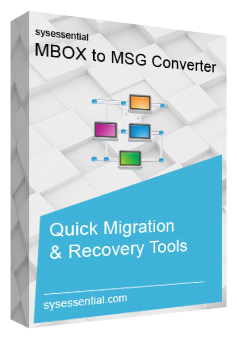 Sysessential for MBOX to MSG Converter, a known email conversion software solution recommended for migrating MBOX files into MSG file format. The tool is highly commendable when user is migrating from one email application into other. If you want to analyze software in free trial run then download the application in freeware mode and test the functions and features for sure. The demo will migrate first 10 MBOX emails into MSG. This interactive software application has high level of user interface which leads to show everything in detail prior migrating emails from MBOX files into MSG file format. Tool maintains complete hierarchical structure even after conversion is done. You can make investment in the application in any of the required licenses as cost of the tool is affordable. For more details about cost, go to the main website and catch the real price! You can save the converted MBOX files into MSG file format with ease. It facilitates to save converted emails into MSG file format. Software makes use of latest techniques which results into giving positive impact on the folder structure, email properties, email format and so on. The tool will not affect data integrity at all. Users queries are sorted out through free of cost trial edition. Support team supportive of giving all the software details and solve any technical issues in soon. The queries are sorted out all the time as team is always there to support and guide you in time of the hour of need. Tool runs simple conversion steps which lead to export bulk emails from MBOX file format into MSG file format. Sysessential for MBOX to MSG converter supports giving latest updates time to time. This keep user updated and they are well-aware of what new is added to the tool. This application consisted of crucial tactics for making logical algorithms and conversion into MBOX files into MSG. Software uses active features and latest significant functions for ultimate ease. The application runs on all the Microsoft Windows editions such as Windows 10, 98, 958.1, 8, 7, Vista, XP, 2000, and Windows Server 2012, 2008 R2, 2008, 2003 R2, 2003. How free demo is different from fully operable mode? The free of cost trial edition of Sysessential for MBOX to MSG Converter is supportive of migrating first 10 MBOX emails in MSG file format. You can closely analyze the features and functions before performing complete email data export. Is software capable to run on all Windows OS Editions? Will software migrate complete data? It is up to users choice whether to make complete data conversion or only selective data migrate. This help in making limited data convert rather than wasting time in full conversion which for sure consumes lots of time. How to catch software’s updates? Users are provided with the automated updates through customer care team of Sysessential. They will make you aware of new in the too by regularly sending updates at your end. How to solve technical and non-technical problems in the tool?